The main frame is the foundation of any bagger and it is critical that the frame stay rigid to keep the rotor running true. 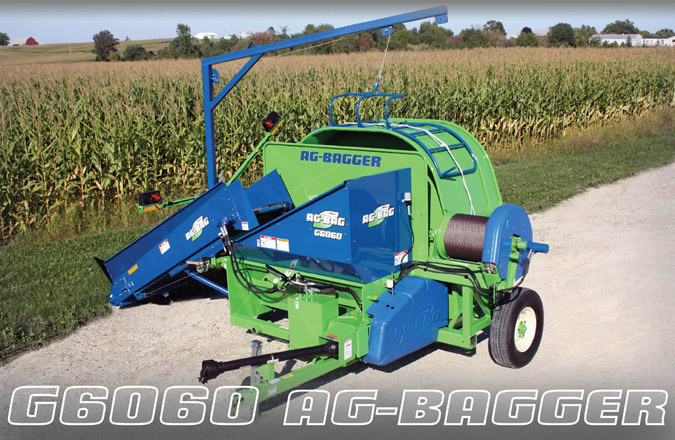 The Ag-Bag 6000 series frames are made out of heavy wall structural steel tubing and heavy gauge flat plate throughout to create a solid foundation to an exceptional bagger. The rotor and tunnel design are the key to a well packed bag. Ag-Bag started in 1978 and was the first company in the United States to build bagging machines. Ag-Bag wrote the book on where the rotor needed to be placed, how wide it had to be to for a given tunnel size, how many teeth the rotor needed and where they had to be positioned. Low rotor position provides consistent packing through the entire bag. The G6060 baggers are equipped with a self-contained hydraulic system that runs off the dual output gear box. The dual cable system allows you to make a well compacted bag with ease. Large industrial disc brake(s) and a simple brake hand pump and brake pressure gauge control the rate of cable release. Ag-Bag bags have convenient “stretch gauges” continually along the bag to insure consistency. The bag back stop is a heavy duty steel frame webbed with rope to insure no damage to the bag. An optional lightweight aluminum back stop is also available for the G6060 baggers. Power requirements on the PB6000, G6060 & G6070 models only need a maximum of 120 HP! The horsepower requirements on the G6070P planetary drive model is only a maximum of 120 HP but can take up to 150 HP! Bag Boom & Bag Cradle. All models are available with a bag boom and bag cradle.